Welcome to the Ace Way of Retailing (AWOR)! Our Store Systems and Operations team partners with all departments, including Ace technology vendors, internal organizations and industry experts, to assess retail trends and deliver solutions that improve sales, lower costs and enhance the customer experience. Come see us in Booth #4661 to recognize all of our best practices for operating your business! The Ace People Management group provides resources to manage your people from hire to retire. We can help you streamline your processes to take labor hours out of your back office and put your sales associates on the floor helping your customers. Our goal is to create the Most Helpful Store Associates on the Planet. Every store’s goal is to have the right product, in the right amount, at the right price when your customers need it. To help you deliver this promise, the Inventory Management team has best practices for your ongoing store procedures and tools to measure the health of your business. To focus your efforts, there are four steps you can take today to drive immediate results. Then, visit us in Atlanta to see how implementing these actions will impact your business. Financial Management best practices help you effectively manage the financial aspect of your business. Offerings include the Ace Budget and Cash Flow tool and the Ace Statement Auto-Coding software. Stop by our booth to discuss how we can help streamline your finances. The goal of our Marketing and Promotions team is to drive traffic, increase loyalty, maximize sales and minimize setup time. Find our booth to discuss what is working (or not) in your store. Also in Atlanta, come check out some of the new features Store Systems is working on, such as mobile POS solutions, contactless payments and real-time Ace Rewards coupon validation. 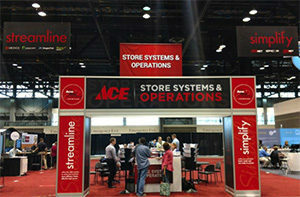 Register now for the Spring show and visit the Store Systems and Operations team in Booth #4661. February 10 is the last day to register for the Ace 2017 Spring Convention & Exhibits and have your badge mailed to you.